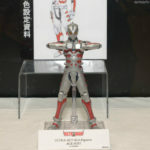 Now that the Ultraman manga is in full swing on both sides of the pond it’s no surprise that the series is proving popular with figure manufacturers. At this year’s Summer Wonderfest a number of different companies had figures on display, including Sentinel, ThreeZero and of course Bandai Tamashii Nations. Check out the full selection of images after the jump!